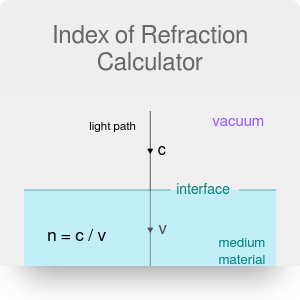 The index of refraction calculator will allow you to calculate the refractive index of any medium. It is also a tool useful for determining the speed of light in any medium. Continue reading to discover the index of refraction formula and to learn how to find the index of refraction. The index of refraction, called also the refractive index, describes how light propagates through a medium. It is a dimensionless quantity and it determines how much light is bent (refracted) when entering a different medium. In essence, refraction means a change in the speed and wavelength of the wave. n is the refractive index. The typical values for refractive index are between 1 and 2, but there are some higher values. As nothing can travel faster than with the speed of light, there are no materials with the index of refraction lower than 1. Determine the speed of light in the analyzed medium. For example, let's assume 228 850 km/s. Divide the speed of light by this value. 299 792.46 / 228 850 = 1.31. The obtained value is the refractive index of the medium. You can use this value to calculate the angle of refraction, using our Snell's law calculator. You can also take the value of the refractive index directly from the list below. Index of Refraction Calculator can be embedded on your website to enrich the content you wrote and make it easier for your visitors to understand your message.